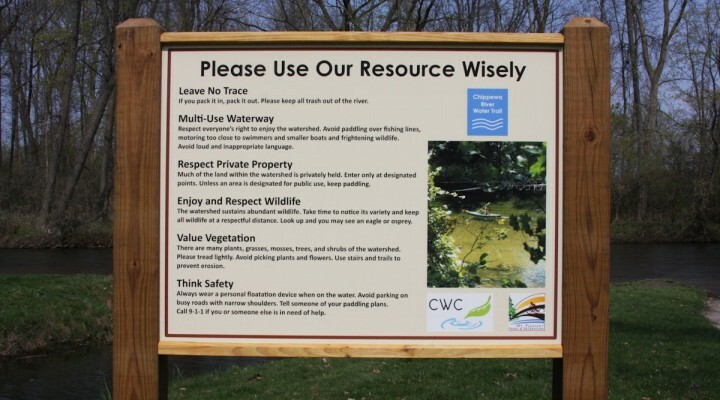 In March 2012, the Mount Pleasant City Parks and Recreation Department installed the first of a series of signs designed to promote the wise and safe use of the Chippewa River. The first sign was installed at the Nelson Park universal access point in Mount Pleasant. It is one of ten that will be installed at primary canoe and kayak launch points from Majeske’s Landing west of Mount Pleasant, to the Chippewa Nature Center near Midland. Funding for these signs was provided by the Chippewa Watershed Conservancy and the Isabella County Parks & Recreation Department as part of the Chippewa River Water Trail project. In addition to these signs, at total of 50 one foot square signs are being installed on the upstream side of every road and trail crossing from Barryton in Mecosta County, through Isabella County, down to the City of Midland where the Chippewa River joins the Tittabawassee. These signs, with white letters on a reflective light blue backing, will aid river users in determining their progress along the river, as well as help first responders locate persons along the river who may be in need of help. Sign installation is the final phase of the water trail project, which included production and distribution of 7,000 copies of a folding map of the river and creation of a web-based version of the map hosted on the Isabella County web site. 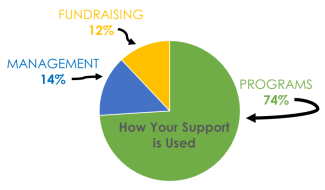 Funding for various phases of the project was provided by the Saginaw Chippewa Indian Tribe, Saginaw Bay Watershed Initiative Network, Bay Area Community Foundation, Isabella County Parks & Recreation Department, Mount Pleasant Parks and Recreation Department, and the Chippewa Watershed Conservancy.